In the peaceful country town of Walkerton, 300 students and 16 teachers at Walkerton Public School were looking forward to the Victoria Day weekend. It had been a long, cool spring and although the forecast wasn’t “sunny and hot,” the weekend was sure to bring celebratory fireworks and outdoor barbecues. The mood in the school was upbeat as Martha Barrett dismissed her grade 7 class on the afternoon of Friday, May 19. Across town at Brant Township Central Public School, Kerry Withrow was dismissing his grade 8 class, little knowing it might be years before things would ever be the same again. The town’s 5,000 men, women and children, many of whom had moved there to escape the pollution and stress of urban life, were about to face an enemy that had apparently been lurking in their neighbourhood for years - E. coli. “That Victoria Day was completely normal for me,” says Martha. “However, when I got to school the next day, there were water coolers throughout and a “Boil Water” warning in effect. It was much the same at Brant Township. “Because of the water alert, the principal called an assembly for first thing that Tuesday morning. We were told not to drink the water but that washing in it was all right,” says Kerry. By Thursday of the first week of the crisis, it was clear that things would not be back to normal until the following week at the earliest. Both schools were to remain closed until at least Wednesday, May 31. The residents of Walkerton were beginning to realize the true gravity of the situation. “Even in those early days, the town was beginning to pull together,” says Martha. “Our staff wanted to help too. Many of us volunteered for the work crews that were set up to help with water distribution, both at the arena and at a local bank. Volunteer shifts were also set up at South Bruce Grey Health Centre. These people helped by giving directions and support to the many sick people and their families who were arriving at Emergency. Most of us at Walkerton also contacted our students to inquire about their health and the health of their families, and to assign homework. All our plans for end-of-year class trips ground to a halt." “It was two weeks before it finally sunk in that we would not be going back to school in Walkerton for the rest of the year,” says Kerry. “During that time, sickness was everywhere. I know many who were ill but who did not go to the hospital. These people were not counted among the 1,000 reported cases. I would estimate that the actual number of Walkerton residents who were infected by E. coli was much higher than that. On June 1 a mass meeting was held at the Knights of Columbus Hall for staff from both Walkerton and Brant, as well as Walkerton District Secondary School. Both Martha and Kerry were there to learn as much as they could about the situation. Representatives from the Bluewater District School Board and the Bruce Grey Owen Sound Health Unit were on hand to answer questions about resuming classes. Still, the teachers left without any clear answers. Meanwhile, the Bluewater DSB had been listening to concerns from the Ministry of Education about the loss of instructional days. The day after the mass meeting, Bluewater’s Director of Education, Janet Glasspool, said that Walkerton students should go back to school - but that classes should be held in locations outside town for the rest of the year. Principals were responsible for finding suitable locations. “Because Walkerton is a farming area and the next closest town - Hanover - is also very small, and with all of us looking for places at the same time, things became a bit of a scramble,” says Martha. On Tuesday, June 6, Martha learned that students from Walkerton would be bused to the Cargill Community Centre, about 10 minutes north of the town. Brant Township Central classes would be split up. Kerry’s grade 8 class would meet in the foyer of Hanover Baptist Church, a few kilometres northeast of Walkerton. Other classes would be held at Hanover Red Lutheran, Hanover Presbyterian and the Hanover Town Hall. A few kilometres away, Cargill Community Centre was being readied as a temporary school. Equipment was moved and portable phones delivered. On Wednesday, June 7, all but a handful of Martha’s grade 7 class met at Walkerton and were allowed into their regular classrooms to clear out their desks and gather any personal belongings. “This was their one and only chance to do so before the fall,” says Martha. Shortly after 9:00 a.m., teachers and students boarded the buses for their first day in Cargill. The Intermediates were the first to move in, but the novelty of the situation soon wore off and students and teachers settled down to catch up on work that had been missed for two weeks. “Because of the setting, we decided to stagger the start back to school and it worked well. Every teacher was responsible for contacting all members of their class about their date of re-entry,” Martha says. “Boxes of materials were gathered and sent to Cargill. And as the Community Centre is one large open area, dividers were needed to create classrooms of some sort. One of our staff persuaded a local sales agent to lend us a large trailer to use as our staff room. This enabled us to gather as a team, away from the eyes and ears of our students. “One day, we were sitting in our makeshift staff room when a car pulled up. Out got Toronto Maple Leafs Tie Domi and Sergei Berezin. This was a totally unexpected visit, and it took a while before the local media found out what was happening. Interestingly, the Leaf’s visit drew a few more of my students out of their homes and back to class. “The Community Centre solution wasn’t ideal, but Cargill treated us royally. The community was extremely supportive of its temporary school. For example, we were given keys to the local library and this alternative location offered a quiet setting, a television and a VCR. Cargill Park provided a tremendous spot for recess. On several occasions, local citizens provided cooked lunches for all the Walkerton staff. “On the downside, the Community Centre was also used for other purposes. Though this happened mainly on weekends, all of the classrooms had to be dismantled and loaded onto a tractor trailer. Classrooms were reassembled the next morning back. in their theatre. One week later, we performed two wonderful nights of Annie. 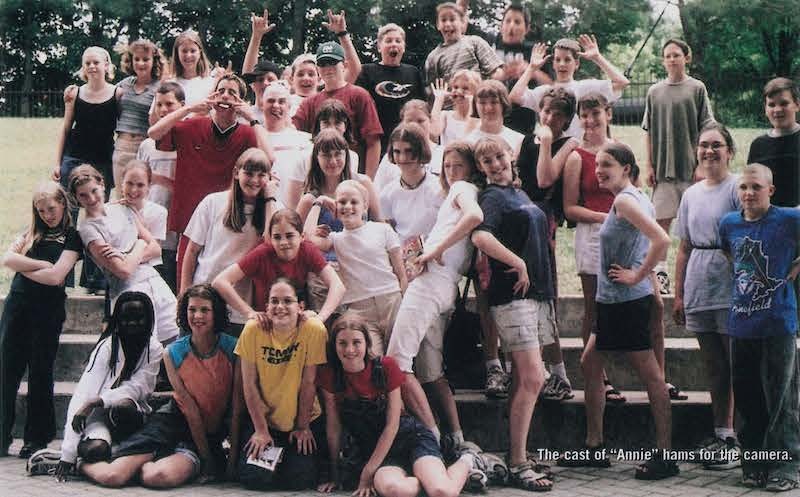 We then took the cast to Canada’s Wonderland to perform for the adjudication at the Westwood Theatre. Once again, the students outdid themselves. I couldn’t have been a prouder teacher. “As well,” Kerry continues, “we were able to complete all the field trips and graduation trips as planned, largely due to the support of our incredible staff and especially our principal. “As the new school year approaches, we are back in our school buildings but still unable to use Walkerton’s water system. In our school, an extensive system has been installed. We have been entirely cut off from the town water. Large plastic holding tanks placed in the school’s back hall, as well as a maze of plastic lines, supply water to the toilets and sinks. “The current cost for relocating Walkerton’s five public and Catholic schools and repairing the damage to the schools’ water systems is estimated at $600,000. The bill for cleaning up the entire town’s water system will probably be 10 times that,” says Kerry. “The situation in Walkerton was, and still is, extremely tragic,” concludes Martha. “While we were very fortunate that there were no deaths in our direct school community, many were very ill and it was a frightening situation for everyone. The silver lining was the way in which not just a community, but a whole area came together to offer support and to work together through this disaster. The support that went from one to another was truly incredible to experience.” “Kerry, Martha and their colleagues did a marvellous job keeping things running in the fâce of enormous difficulties,” says Cynthia Lemon, President of ETFO Bluewater. “For example, those who were relocated to Cargill were teaching in a slightly dank arena where all the students, except kindergarten, were taught in one large open area. It was impossible to work undisturbed by the noise. And teaching in church basements in Hanover was not much better. As with most basements, the windows were small and the lighting dim. “Primary teachers had some special challenges. There was great concern about anything that had come into contact with water, including toys, paint, sand and water tables. Everything that couldn’t be sanitized was thrown out. A lot of these things had been paid for by our members out of their own pockets,” says Cynthia. At ETFO’s Annual Meeting in August, Cynthia challenged Janet Ecker, Minister of Education, to replace the money that has been spent by the Bluewater District School Board and the teachers in the course of this crisis. Ecker said she would look into the situation, and later she announced that her Ministry will pay for anything that has to be repaired or replaced in the schools. However, it will be a long time before the human cost of the upheaval in Walkerton is finally laid to rest.